Our robotic future is fun… and a little scary? Photo courtesy of Parrot S.A. Yesterday, at an exclusive event in downtown Toronto, members of the press were invited to the official launch of two new robotic products from Parrot S.A., the French company responsible for popularizing so-called “drones” – remote controlled quad-rotor flying platforms that contain a pair of cameras capable of recording high-definition video. Parrot’s two new products, part of a line they call “MiniDrones,” follow in the footsteps of the AR.Drone. The Rolling Spider is a $119 miniature quad-rotor flying vehicle that fits in the palm of your hand. Equipped with detachable wheels that give the Spider an angry-bee-trapped-in-a-hamster-wheel appearance, it can roll along floors, up walls and along ceilings without any danger of the tiny propellers coming in contact with nearby objects. Thanks to a plethora of on-board sensors and gyros, The Rolling Spider is simple enough for a child to operate. It even has a high-res, downward-facing camera that can snap still images during flights. The rechargeable and replaceable battery is good for about 8 minutes of continuous flight. You can fly the Rolling Spider indoors or outside, but because it’s connected via Bluetooth to your phone or tablet, the operational range is limited to about 66 feet. In practice, the Rolling Spider is a hoot to fly. Amazingly stable yet highly responsive, it emits a high-pitched whine that makes comparisons to bees, wasps or even mosquitoes more apt than to a spider. Horizontal flight is buttery-smooth while vertical lifts and drops happen incredibly fast. Irritated by a pilot who decides to fly it too close to your head? Go ahead and swat the Spider out of your way – it will right itself and continue on its flight path as though nothing had happened. We can only assume it doesn’t take such acts of aggression personally. Parrot uses the same flight control scheme from the AR.Drone with the Rolling Spider and it is truly easy enough to learn that you can fly the Spider confidently after a few minutes of experimentation. Getting the Spider to execute an aerobatic 360 degree flip in mid-air requires nothing more than a double-tap on the smartphone’s screen. 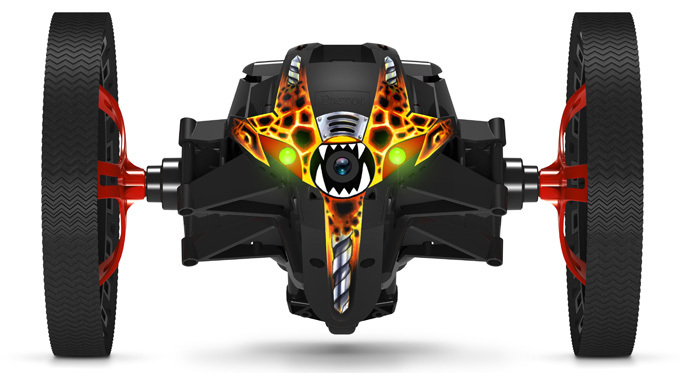 Finally, if you can bare to separate yourself long enough from the Rolling Spider to let your kid play with it, they’ll be delighted to find that Parrot has included a set of stickers that can be used to customize the Spider’s appearance. Most of them make the Rolling Spider look like something that’s about to bite you. 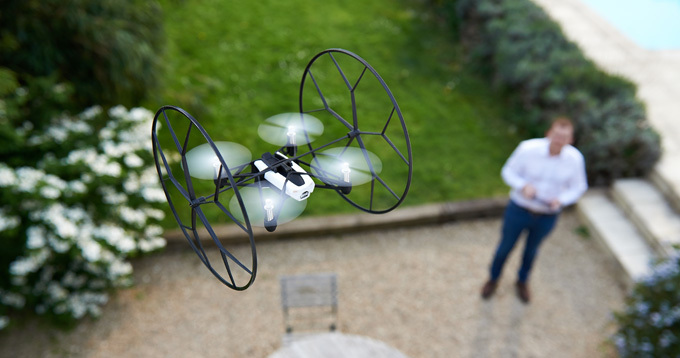 Their second product in the MiniDrone line is the $179 Jumping Sumo. A quirky blend of remote-controlled car, mobile camera platform and, well, grasshopper, this two-wheeled vehicle has more in common with a Segway scooter than a garden-variety RC car. Equipped with a wide-angle front-facing camera, the Sumo can stream live video of everything it sees back to the smartphone, giving its driver a first-person perspective. The diminutive vehicle can be driven manually, using the on-screen controls and can perform impressive maneuvers such as 90 or 180-degree turns in an instant, or you can pre-program a specific route which can then be executed at the tap of the screen. But the Jumping Sumo’s most impressive trick is, as its name suggests, the ability to jump up to three feet into the air, with a level of precision that allows experienced drivers to land it on a surface not much larger than the Sumo’s own footprint. The jumps are accomplished via a powerful, spring-loaded piston that can be primed and released in less than two seconds. Flip the Jumping Sumo “upside down” (a hard position to identify when dealing with a robot that doesn’t seem to care which way is up) and it can use the same mechanism to launch itself away from fixed objects, or “kick” loose objects out of its path. In an impressive demonstration of strength, I watched as a Parrot employee put a sizeable dent in an empty pop can using this technique. While it’s clear that these two MiniDrones—which go on sale in August—are very much designed to be toys (parents get ready for the holiday wish-list onslaught), make no mistake, these are highly sophisticated pieces of technology that have more in common with commercial and even military drone applications than their size and price would indicate. With the exception of their operating distances, battery life and perhaps durability, these two “toys” represent cutting-edge technology. If you’ve ever spent time wondering what your kids will be equipped to do when they enter the job market, perhaps it’s time to introduce them to a MiniDrone. It could set them up for an upwardly mobile career path in our increasingly robotic world. Have I shared with you my enthusiasm for remote-controlled helis and their quad-rotor brethren? No? Well I love ’em. I’m 42-years-old and there’s just something about these little indoor choppers that fulfils a boyhood dream which I’ve apparently been harbouring for a long time. Whatever the reason, I think these things are awesome so I was delighted to learn that the coolest remote-controlled toy on the planet, the Parrot AR.Drone 2.0 will be up for pre-order at The Source starting March 9th. General release for the device is May of this year. What’s this? You’ve never heard of the AR.Drone? Allow me to introduce you: The Parrot AR.Drone is remote-controlled quadrocopter (4 rotors instead of the usual 1) that can be controlled via your iOS or Android device of choice over Wi-Fi and comes equipped with 2 on-board cameras – one that looks forward, the other looks straight down. The latest version (2.0) of the AR.Drone lets you watch the feed from the forward-facing cam on your controlling device in real-time to give you a “pilot’s eye-view” of the action, but you can also record this video feed for acquiring the bragging rights to an especially impressive flight. These videos can be recorded to your smartphone/tablet’s memory or saved via the built-in USB port on the AR.Drone. We got a chance to see the AR.Drone 2.0 in action at CES 2012 this year and their demo was impressive. Of course, the original intent behind the cameras was to enable AR gaming (thus the AR or Augmented Reality in the AR.Drone’s name) is still very much the focus of this craft, and with the optional game downloads you can engage in air-to-air combat with other AR.Drone pilots. Just like the original AR.Drone, version 2.0 comes with a removable set of indoor “hulls” – basically styrofoam bumpers that surround the blades of each of the four rotors. You can keep these on when flying outdoors for greater crash protection, but the vehicle will be much less stable in windy conditions. Until now, the only Canadian retailer who carried the AR.Drone was BestBuy, but it seems Parrot has established a slightly larger distribution network for the 2.0 release of the product by partnering with The Source. This move makes tons of sense. Not only are there way more The Source locations in Canada (over 700) but The Source is already the go-to shop for RC enthusiasts. I doubt there is another bricks and mortar retailer with a greater selection of RC toys and the AR.Drone is the perfect complement to that collection. The Parrot AR.Drone 2.0 will be $329 when it goes on sale later this year.